What kind of plane of existence are you thinking about ? Is it a elemental plane? What kind of environment will you meld this castle into? What kind of castle medival, japanse, europoean, ? I would really decide on a genre and go with it for your references to help hone in on something as opposed to keeping your self so wide open . Do you already have a post apolocypse reference in mind ? 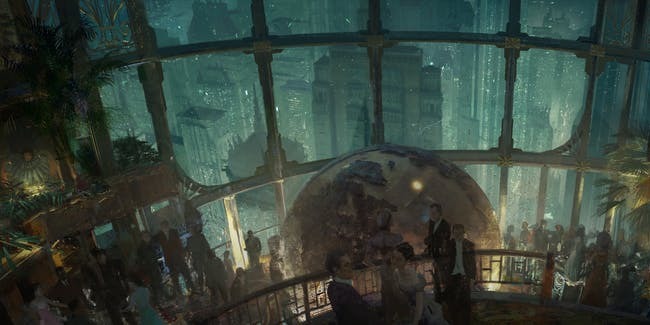 I couldnt help but to mention Bioshock here… under water , steampunk… lots of good inspiration. Keeping in mind that this weeks video says keep it real if your using reference. But you could get inspiration for maybe some designs from other concept art :). So the idea is to draw a city with enough details to understand the scale, put in a way that is not too busy and does not rely too much on photobashing. not yet! I have been looking at war torn cities for inspiration. I am leaning towards Mad Max and Hunger games! So many options!! soo little time… I cant wait to see what you put together though. 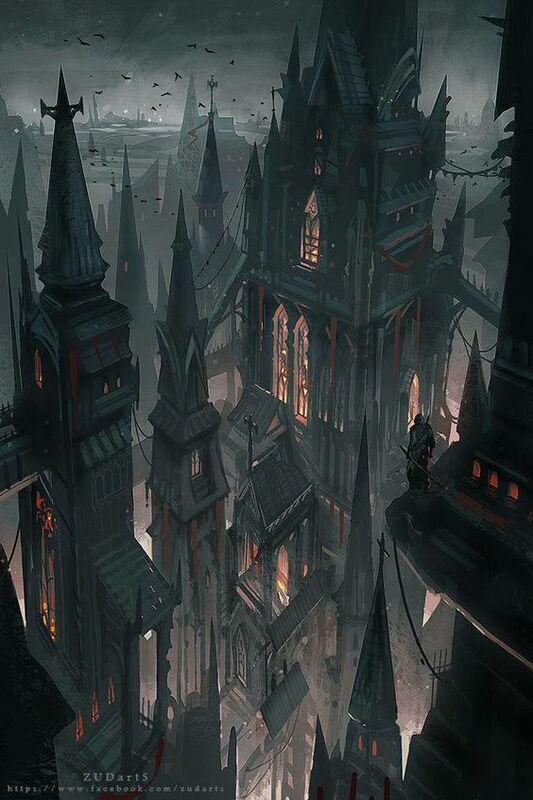 My idea is create a city to understand depth and color, I want to bring gothic or fantasy elements. Like in Castlevania or even Lord of the Rings. Ireally need help with pretty much of everything with environment design, sorry!! ! Early morning is actually a great idea. 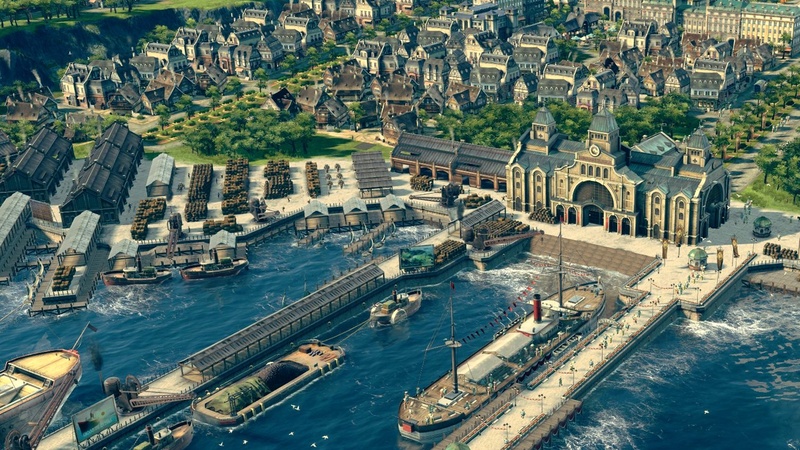 Thinking of that I found some really cool screenshots from Anno 1800 that catches that mood. oh right! Thanks for the suggestions! I love anything and everything science fiction/fantasy. I’d like to create a futuristic city market that is bustling with energy, a more vertical design because of the sheer amount of shops needed to keep up with the booming economy. Maybe even some mobile shops (I’m thinking of the floating restaurant in The 5th Element), however I do not want to end up with a cyberpunk feel. I’d like to incorporate a lot of mechanical things and a lot of designs that harmonize nature and technology. I really love the beauty of the futuristic rendition of San Francisco from Star Trek, and would like to create that sense of scale while also capturing the small interesting details in such a busy world. All of your ideas sound super cool! I can’t wait to see everyone’s final work! For my idea I want to create a post-apocalyptic swamp area - like a world that was once civilised and full of technology but now destroyed by radiation. I’ve got the swamps of Louisiana mixed with atomic waste in mind. @Nekat that sounds awesome can’t wait to see your concept sketches! I am in love with where you want to go with it. I am a huge fan of castlevania. So much rich history,mythology, and imagination. Cant wait to see whqt you drum up. Keep in mind i would look into some more of its history… may e watch the new castlevania animation on netflix and take a gander at vanhelsing the movie for sonething realish…Gotta keep it grounded in some reality to make it believeable. That sounds like a lovely idea. What inspired this? It probably wouldt hurt to throw a firefly reference in here either. Theres a subtle quailty in the show that could give you a example of the types of characters that frequent it. Its going to be interesting… how would you show the toxicity.? What I’d like to focus on in this course is the more general importance of story – the one “royal road”, in my opinion, for escaping the trap of “been there, done that” in concept design. The distillation of his approach: Take the familiar and juxtapose upon it the unfamiliar; and ensure your characters have a fleshed-out backstory. To this end, I’m thinking of trying out his approach in telling a story about a John Carter-esque female astronaut working her way across a landscape that resembles something she left, but just skewed 45 degrees. A little vague, I know, but that’s where the inspiration’s been taking me the past few days. So far i’ve been thinking of including some mutated creatures, maybe with teeth or eyes all around their body. I might take a leaf out of Bloodborne’s book or even the Last of us. i’m definitely going to include some neon colours as well.